How easy In theory would that be to do? And would that be the Pi3? Slayerx wrote: How easy In theory would that be to do? In terms of the putting the emulators onto a MicroSD card and putting in the the pi - very easy. I would use RetroPie as there are lots of guides for it and it's straight forward anyway. In terms of putting it in the case? This would probably be pretty easy as well. The most you'd have to do would be the move the ethernet port and double height USB ports. If I had to do this I would cut off (because soldering it off is hassle) the ethernet port and one of the USB ports and solder off the other USB port then replace it with a single height USB port. The Pi3 already has a Bluetooth radio on board so you don't need to use wired controllers. The USB port would just be to easily add games and plug a keyboard in if needed. There's a new revision to the RP3 called the Model A that is smaller and has less RAM. It also costs £10 less. I haven't seen any bench marks but I would imagine there would be no impact to PS1 emulation by going for the smaller, cheaper model. You can probably find a ps1-style Pi case on etsy instead if you're going all out on emulation. 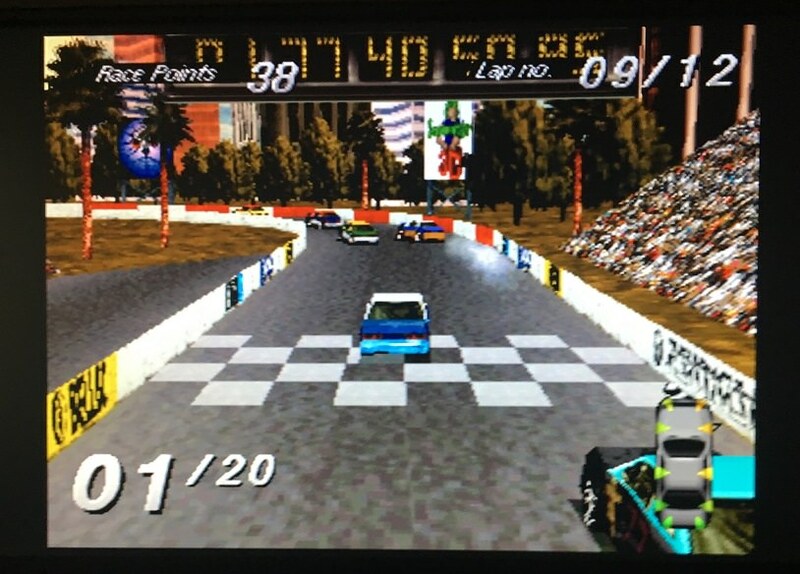 Thought I'd start off with Destruction Derby (what else?). It's hard to describe, but something about it doesn't feel right. In terms of what it looks like it's a bit more vibrant on PS3, however the Classic version doesn't appear to jump or skip like a wonky VHS as the original sporadically does on disc and on digital download...but the background does seem to be a tad jerkier (noticed most around corners). Unless you are running them together or are extremely familiar with the game I really don't see the vast majority noticing though. 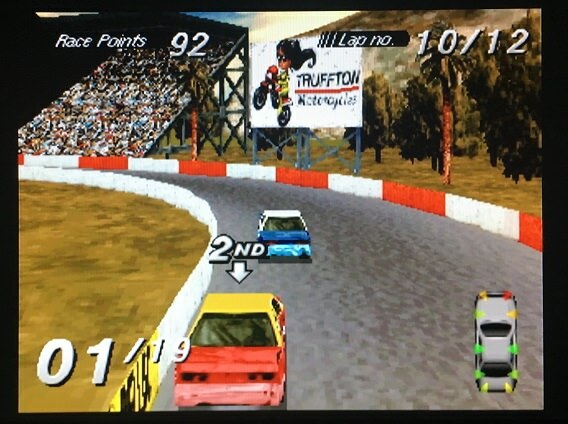 How the PS3 version varies to the disc copy however is with the number of cars running. As you can see it's down to 19 here. By the end of the race it was at 17. 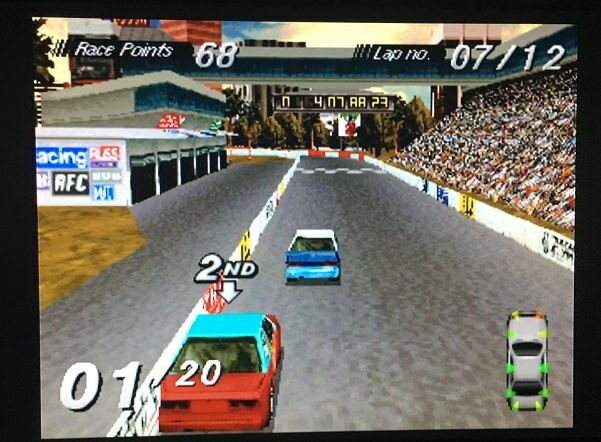 This simply doesn't happen playing the disc copy on this track via a PS1, and as yet doesn't appear to on the Classic either, so the PS3 for whatever reason is handling the AI differently (it's more destructive). In terms of the controllers, I don't favour one over the other, but the cable length on the Classic is bloody terrible. True, there are a few out there but they're not the nicest looking. There are other consoles that 3D print better. I'll probably be able to pick up a spares or repair for cheaper anyway. Thanks, I have a few spare Pi3's that aren't been used I got sale a while back on Amazon I could use. I'll have to key my eye out once people decided to flog the units. Have they done a Nintendo and supplied really short cables on the Classic? Oh, yes. I couldn't sit on my couch and play it, so I had to make do with a dining chair. It's about 4.5 feet. The USB/HDMI cables are also limiting in that you can't just plonk the console in the middle of the room. Are the controllers USB? Or are they original PS1 style connectors? And what kind of power plug did you have to get in the end? The controllers are USB, but in the style of the original. I purchased a £5 adapter marked 5v USB Type A that supports 1.0 and 2.0. Everything else in my home was too high for it, I guess. No issues with the SNES. I'm finding these impressions of the actual console really interesting, so thanks. I nearly bought one of these as a gift for a friend, but ended up doing a late switch to the SNES classic when I saw the first few impressions from gaming sites. I'll be honest, whilst it seems like a real missed opportunity from Sony, there's a part of me that's still hankering after one for myself. The emulation software seems an obvious blunder; I'm sure it's capable, but if you're buying a Sony product you'd expect it to be all Sony feel rather than just the casing and look (which seem great). Mind, I'm not really sure that it would ever be possible to keep everyone happy however you'd made this, given the nature of the original console. You could probably lock 20 Nintendo fanatics in a room and they'd eventually come up with a list of games with a fair hit rate compared to the ones Nintendo ended up including on the classic SNES. But the PlayStation was partly a success because of the sheer number of games, with something for everyone, so I'm not sure you'd get quite the same agreement as to what to include. I loved playing Hogs of War, for example, which would probably make literally no-one else's list. It was also arguably the first 'modern' console, with 3D, FMV etc. But then almost all of those things have since been built on and surpassed, so most of the games are good for a short term nostalgia rush, but would you really stick with them for more than a few minutes? In contrast, a lot of the 2-D SNES stuff was arguably near its pinnacle on that machine. And then you've got all the licensing agreements with music and sports games. And the fact that the PlayStation succeeded so massively by opening up to third party game makers, which introduces more licensing issues. And, again, it also supported peripherals which take away from the whole simplicity thing. E.g. probably my favourite game played with friends was Point Blank. But there's no way you could start introducing light guns etc to this simple package. (A problem you'd have with a Dreamcast mini as well). Well the USB cables can be extended at least, though it will impact on the look of them being connected unless someone releases a PS1 themed USB extension cable. Grand Theft Auto is indeed awful, I’m afraid to say. I don’t have the disc for this one (I kept 2) so this is a real disappointment to say the least. A headache inducing jittery framerate throughout. I can’t imagine Rockstar being that happy with anyone playing this for the first time and thinking their debut functioned like this, either. 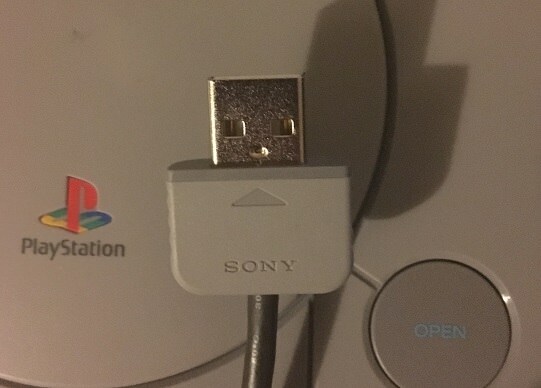 Sleighamorph wrote: Well the USB cables can be extended at least, though it will impact on the look of them being connected unless someone releases a PS1 themed USB extension cable. Aye, true. Though what I really meant with the USB plug thing was about the power cable for the machine itself, as KKlein seemed to have some trouble using a USB port / phone charger to just switch it on, and then needed to go and buy an extra plug. Maybe that's an isolated thing, but if not it's a bit of a Christmas 'batteries not included' moment; it's not the cost it's the inconvenience. I still don't get why they didn't include these things with the Nintendo ones either. They must cost all of 30p or something to make? It is an odd one, I haven't heard any other mention of problems with powering it. I just assumed it would be the same as my SNES Mini and I could just power it from a TV USB port. If there were issues with powering it I would've expected them to be called out in the DF review and I don't recall anything like that mentioned. the PlayStation Classic doesn't require much juice - you can power it using a micro USB phone charger, which is just as well as weirdly, there is no power adapter in the box. This is actually something of an issue as the unit is a little fussy about where it's plugged in - hooking it up to a USB 3.0 port on a PC didn't work, while plugging it into an HDTV was fine. I don't know if it was a conscious decision on Nintendo's part but I actually quite like that they didn't include one, the vast majority of people will not need one and donuts just another piece of waste electronics pushed out into the market that is going to get binned. Hm, odd that it worked from their TV but not yours then. I think Nintendo included one as standard in the USA, and they did bundles on their official shop, but it was excluded from the Euro models for some reason. Nintendo made their own adapter though, so it’s guaranteed to work. Sleighamorph wrote: Hm, odd that it worked from their TV but not yours then. It’s a Sony TV(s), it was inevitable. It’s has 3 ports and they all work with the SNES or for playing 4K. But Sony/Google changed the firmware either this year or last that introduced slowdown intermittently under heavy loads such as with 4K material.